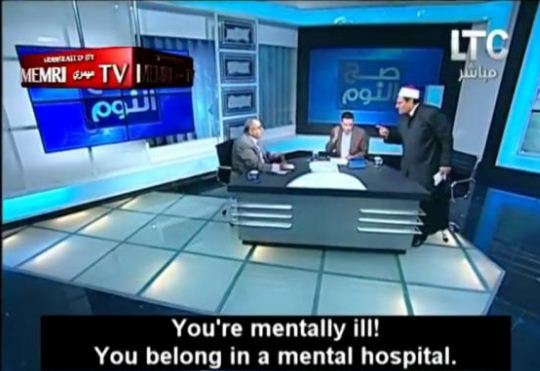 Viewers were taken aback when a brawl erupted on Egyptian television after two guests battled over Islamic religious law. According to Daily News, they physically attacked each other with a studio chair and shoe. The brawl which aired on Egypt’s LTC TV was fueled by the men disagreeing over the use of headscarves. Sheikh Mustafa Rashed, a Muslim legal expert known for his lax rulings on religious matters, ticked off Egyptian lawyer Nabih Al-Wahsh. He vexed Al-Wahsh, when he said the headscarf was a cultural tradition, not a religious duty. The guests hurled insults at each other — and Al-Wahsh questioned Rashed’s scholarly credentials. “You said you were the Mufti of Australia and a scholar in Sydney, but there’s not even a mosque in Sydney,” Al-Wahsh said. Al-Wahsh continued, saying that Al-Azhar, a prestigious Cairo university, had issued a statement saying that Rashed was not a scholar. Rashed retorted by accusing Al-Wahsh of being mentally ill. “You belong in a mental hospital,” he shouted. The show’s host cut to a commercial break when the attacks became physical. He later returned to air the “freestyle wrestling” match that had taken place on the show’s set. Video shows the two men rising from their chairs after the string of verbal attacks. Rashed hurled a studio chair at Al-Wahsh’s head, while Al-Wahsh removed a shoe, and struck Rashed repeatedly. Cameramen rushed to the set to separate the two men, whose argument had broken a glass table and trashed the set. “I did not see this coming. I’ve been working in media for over 20 years, and I’ve never seen a dialogue between two guests deteriorate to the point of physical violence,..” the show’s host Mohamed Al-Ghiety said. The show’s host was visibly stunned. “I could never have imagined that such a thing could happen on my show,” he said. He replayed the video twice without sound, because the dialogue was so offensive. “Words were said that should never have been uttered,” he said.